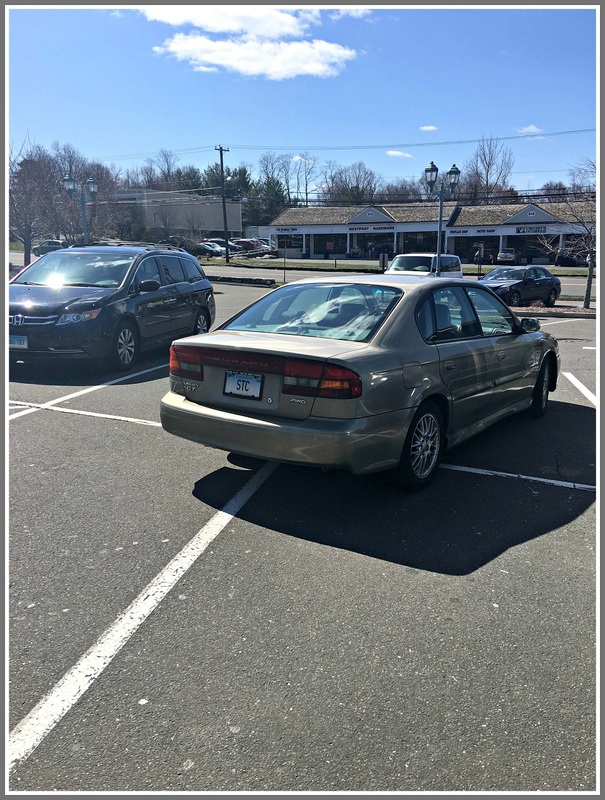 “06880′ has frequently posted photos of drivers who take up 2 parking spaces. Occasionally, we highlight those who manage to hog 3. But this may be the first time we’ve run a shot of someone who managed to park one car across 4 different spots. This may be our worst parker yet. PS: This was not someone leaving the lot. Photographer Merri Mueller sent other photos, from different — and equally egregious — angles. This entry was posted in Transportation, Westport life and tagged entitled drivers. Bookmark the permalink. Kind of an unusual license plate. What could that stand for? Save the Children would be a remote, but unlikely, possibility. Of course, if they are that impaired, they probably shouldn’t be on the roads to begin with. Whenever I see someone parked like this I park as close to them as I would have had they been parked normally, even if it means I have to park at a weird angle. Since they’re doing this to keep other cars at a distance my parking job, hopefully, drives them mad. Was this car parked at one of the proposed dispensary locations? I think they just wanted to break the record!! The lot looks mostly empty and they dashed in for just a minute? Context is everything…BUT this is still obnoxious. A shopping cart is tie-wrapped to the door handle. Love it! I am a “Westporter” transplanted to Texas. There are hurried and entitled people everywhere. I just may keep a few tie wraps in my glove compartment. Merri – you should have waited to see who came out of the store! The guy should thank his god that keyless fobs have replaced keys. Perhaps the “STC” plates stand for Sharing, Thoughtful and Courteous? :):):):) Favorite posts — sorry but they are.